What do you view as being the most significant themes within your education? As themes or topics develop in your course work and you begin to recognize them, you can create corresponding tags to apply to your posts. You can turn the most significant or most frequently used tags into menu items. Be sure to read the post about The Importance of Categories and Tags. 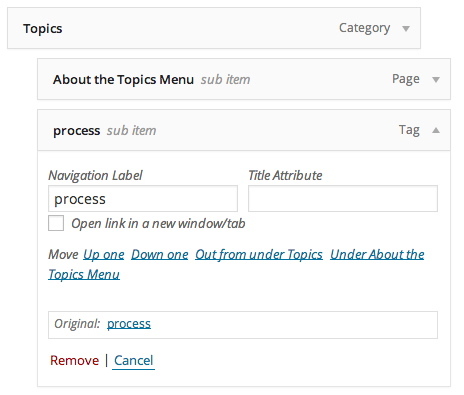 Once you have created and applied a topical tag, you can add it to the Topics menu as a way of aggregating all posts to which the tag has been applied. New topics can be added to the Topics menu at any time. General instructions for working with categories and tags can be found here. General instructions for adding or removing menu items can be found here. To turn a tag into a menu item, follow these steps. In the Dashboard, go to Appearance>Menus. In the upper-right corner of the window, click on the Screen Options tab and check the boxes for Tags and Link Target if they aren’t already checked. Now you should see Tags—along with Pages, Links and Categories—in the list of menu options on the left side of the window. 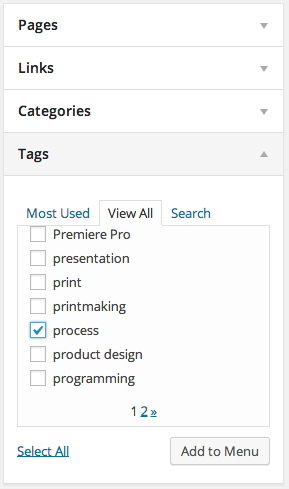 Click on Tags to open the panel and then select all of the tags you would like to turn into menu items. Click Add to Menu and the selected tags will be added to the bottom of the list of menu items on the right side of the window. 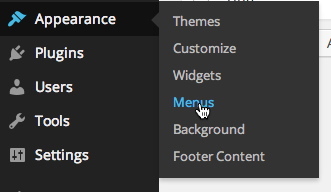 Drag the new menu item so that it is indented beneath the Topics menu item. If you click on each one, you can edit the Navigation Label. You might want to capitalize the first letter of the tag. To remove a menu item, click on the downward pointing triangle to open its panel. Then click on Remove at the bottom of the panel. The first item you might want to remove is this page, About the Topics Menu. You can always find it later via the Pages tab of the Dashboard. Once everything is set and in place, click the Save Menu button. Now view your learning portfolio, refresh the page and see how the Topics menu has been updated. Here is a general video tutorial on working with menus. Who’s Story is this Anyways?